New day, new shop Fortnite: today, Wednesday, march 20, 2019 is the turn of two Skins unpublished-that had been seen for several days by the dataminer of the Battle Royale weblog Epic Games. This is the Psion, and Axiom, a sort of warriors with futuristic which adds to the game mode Battle Royal. 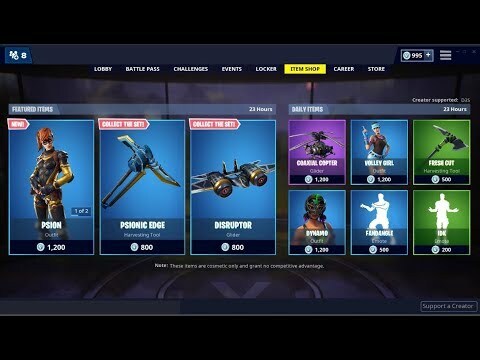 The content in the evidence of the shop Fortnite of today, Wednesday, 20 march 2019, therefore, are the Skins Psion and Axiom, both of which are rare and therefore both proposals at the price of 1200 V-buck each (about 12 euro at the exchange rate); and to complete the entire set, however, you’ll also need the tool collection Blade Psionic (800 V-buck) and hang-gliding Jammer (800 V-buck). All the contents are rare, so the overall price of the set is maintained on the figures acceptable. Here below you will find all the contents of the shop Fortnite of today, Wednesday, 20 march 2019, within a handy list.